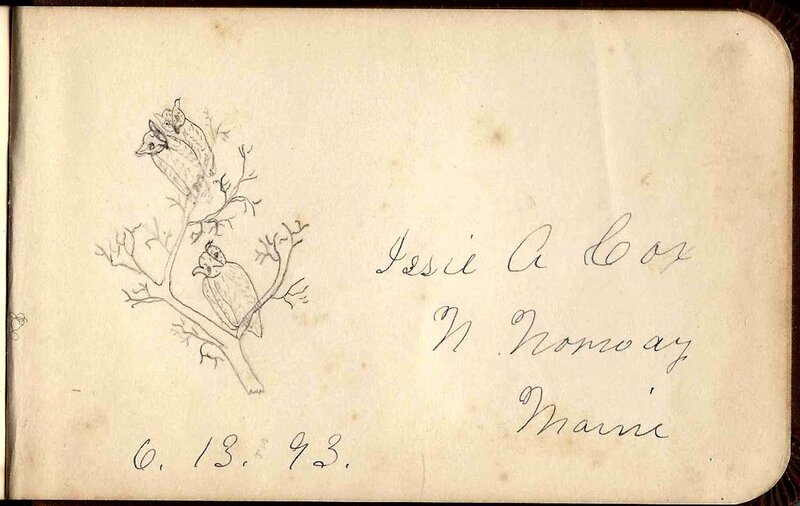 1890s autograph album of Bessie B. Towne of Norway, Maine. The album is approximately 6-1/4" x 4" and contains the sentiments of 38 of her relatives, schoolmates and friends. An alphabetical list of the surnames and of the signers and their sentiments appears at the end of this post. Bessie Belle Towne was born 8 August 1876 at Norway, Maine, daughter of Franklin Pierce Towne and Emma L. (Walker) Towne. Her paternal grandparents were Ansel and Julia Ann (Hobbs) Towne. Bessie's grandfather Ansel Towne signed a page in a shaky hand on 16 January 1890. He spelled his surname as Town. Someone with a steadier hand wrote in pencil: "Age 83". Ansel Towne died 30 October 1893. Bessie's maternal grandparents were Orin and Salome Ann (Durgin) Walker. 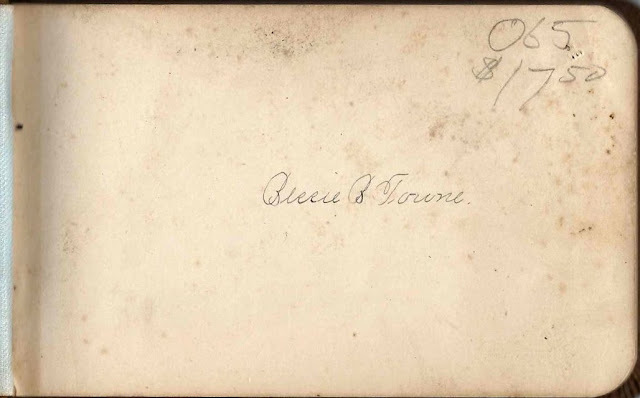 Bessie's sister Katherine M. Towne, "Katie", signed a page at Norway, Maine, on 12 January 1890. Although his name is hard to read, I believe this page was signed by Bessie's paternal uncle Amos Towne. 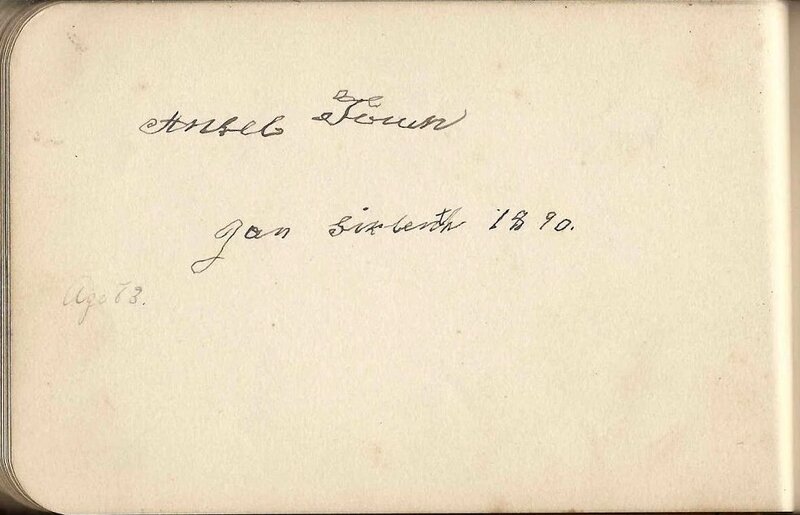 He signed his page on 28 August 1890. He wrote his residence, but it's hard to read. It might be Greenbush, Massachusetts, which I believe was a village in the town of Scituate. Three signers indicated they were Bessie's cousins. 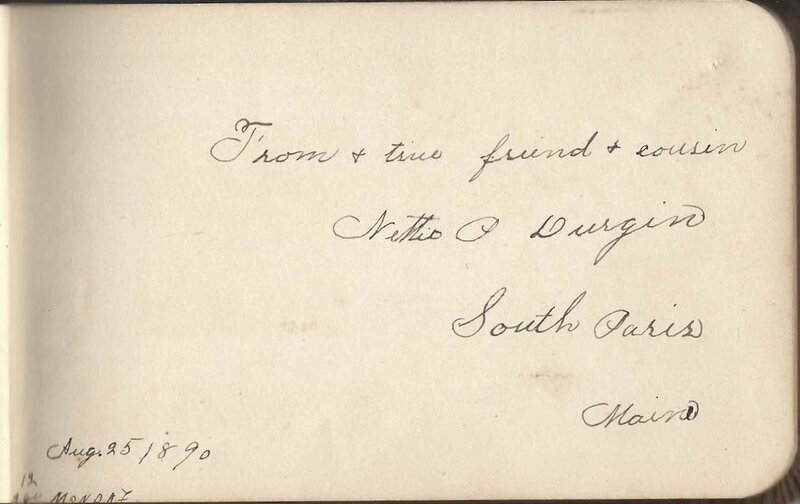 Cousin Nettie P. Durgin of South Paris, Maine, signed a page on 25 August 1890. 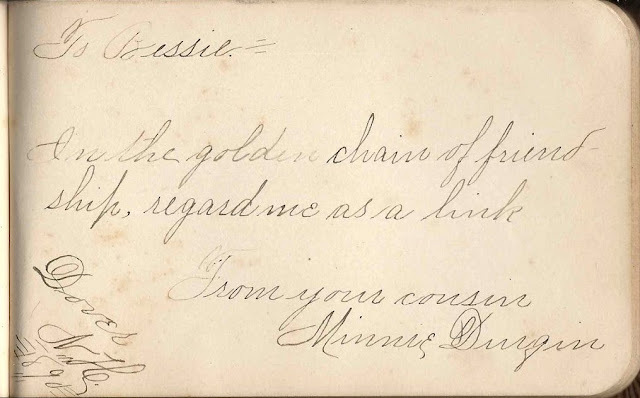 Cousin Minnie Durgin signed a page at Dover, New Hampshire, in 1890. 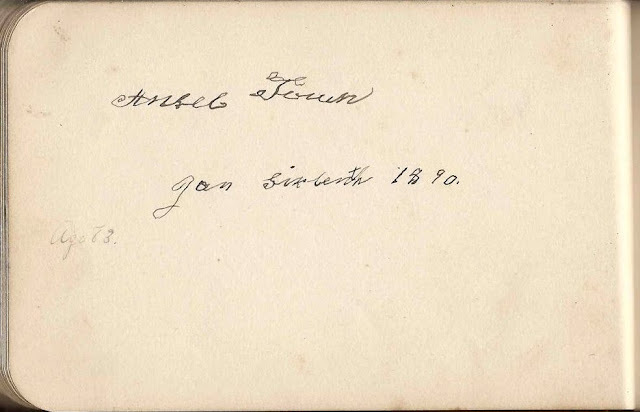 Cousin Inez M. Stuart signed a page on 8 May 1891 at what looks like "Yagger". On 20 June 1904 at Norway, Maine, Bessie Belle Towne married William Azro Delano, son of Azro Emery Delano and Emily Frances (Upton) Delano. William was born 8 August 1876 at Stoneham, Massachusetts. It appears that he and Bessie shared a birthday. Sadly, Bessie Belle (Towne) Upton died relatively young on 7 August 1917 at Norway, Maine. I don't believe Bessie and William had any children. If you have corrections to the information above, or information on any of the signers listed below, please leave a comment or contact me directly. Thanks! 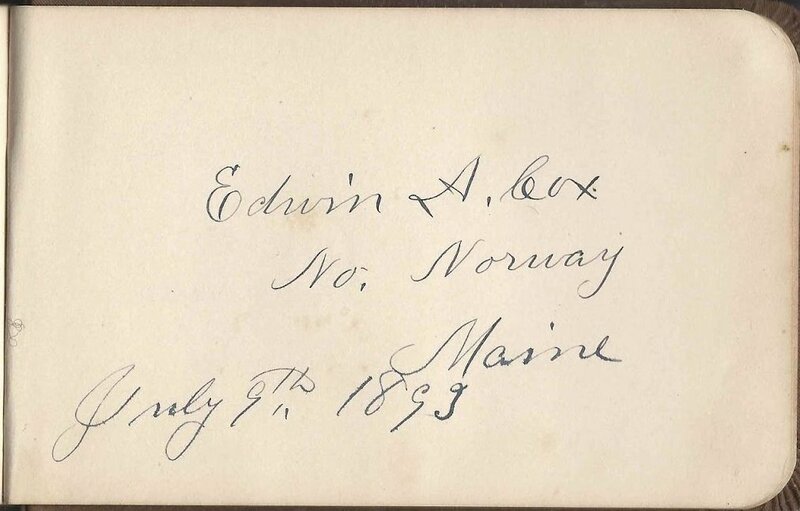 Issie A. Cox of Norway, Maine, signed the last page in the album on 13 June 1893. She drew three owls in a tree. According to a reader, she was Issinella Amanda (Hobbs) Cox, wife of inscriber Edwin Augustus Cox and mother of inscriber Mineola Cox. Chris, signed on 14 January 1893 "To Bessie, When the golden sun is setting And your heart from care is free, When o'er a thousand things you're thinking, Will you sometimes think of me. Your truly, Chris"
Myrtle Bacon of Bryant Pond, Maine "A good fame is better than a good face." Frances Beane, signed on 27 April 1890 " 'Not he that repeateth the name But he that doeth the will'. Longfellow. Your friend." "N.H.S. '92"
Arthur Bonney of Greenwood, Maine, signed on 24 June 1892 "Better then to tell the truth than to tell thee a lie"
Blanche Bradbury, signed at Norway Lake, Maine, on 16 February 1890 "Love many, trust few, - And always paddle your own canoe." Cora E. Brown of Norway, Maine, signed on 10 January 1890 "One of your many friends." Minneola Cox of North Norway, Maine, signed on 1 June 1893 "Round went the album, hither it came, For me to write in; So here's my name." According to a reader: Daughter of inscribers Issinella Amanda (Hobbs) Cox, "Issie" and Edwin Augustus Cox. 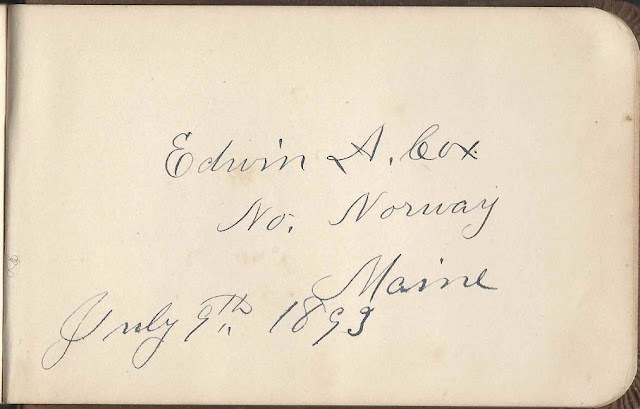 Issie A. Cox of North Norway, Maine, signed on 13 June 1893. Issie drew three owls in a tree. According to a reader: Issinella Amanda (Hobbs) Cox, born December 15, 1853; married Edwin Augustus Cox September 23, 1875. Inscriber Minneola Cox was Issie's daughter. 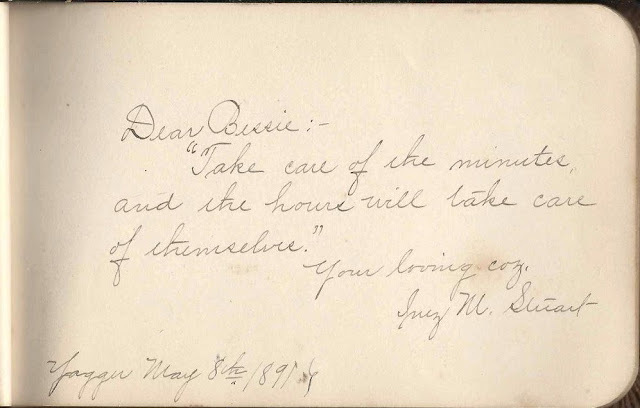 Frances L. Crockett of Norway, Maine, signed on 17 April 1891 "In the chains of memory, regard me as a link. Your friend and schoolmate, Frances L. Crockett"
Rosalee M. Dunn, signed on 9 April 1893 "Dear Bessie, My pen is poor, my ink is pale; My hand it shakes like a little dog's tail. Your true friend." Nettie P. Durgin of South Paris, Maine, signed on 25 August 1890 "From a true friend & cousin"
Minnie Durgin, signed at Dover, New Hampshire in 1890 "To Bessie, In the gold chain of friendship, regard me as a link. From your cousin, Minnie Durgin"
Katherine Elliot of Rumford Point, Maine, signed on 13 July 1894 "May your life - Be 'interesting and charming' like yourself. Your sincere friend"
Edmund M. Harlow, signed at Greenwood, Maine, on 24 June 1892 " 'Better be not be at all Than not be noble.' "
Grace B. Holden, signed in April 1891 "Remember, remember and don't you forget That you have a friend in Norway yet." 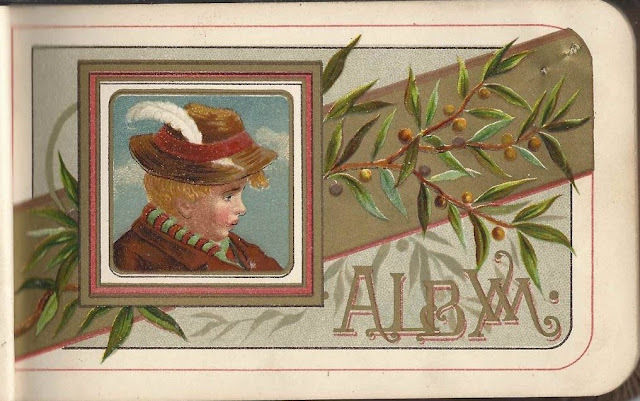 "After school rambles"
Annie L. Millett of Norway, Maine, signed on 27 April 1891 "Class of 94" "Rambles"
Lula M. Packard of Norway, Maine, signed onn 29 April 1891 "Your friend and school-mate" "After school" "(Party)"
Edith M. Philbrook of Norway, Maine, signed on 30 April 1891 " 'A nice man will make haste to forgive, because he knows the true value of time, and will not suffer it to pace away in unnecessary pain. 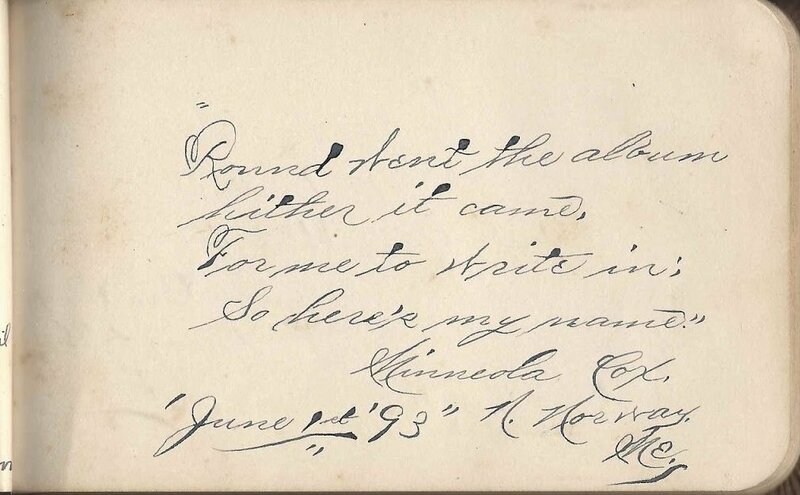 Johnson' "
Alice M. Rounds of Norway, Maine, signed on 25 April 1890 "With best wishes"
Anna M. Saunders, signed at Norway Lake on 12 April 1890 "Guard well they thoughts. Our thoughts are known in heaven." Edith M. Stearns, signed at Norway, Maine, on 29 April 1891 " 'Live truly, and your life shall be a great and noble creed.' Your truly"
Hannah T. Stuart, signed at Norway, Maine, on 13 September 1891 "Bessie, Think of the harvest when sewing the seed." Ansel Town, signed 16 January 1890. He wrote in a very shaky hand. Someone else wrote in pencil "Age 83". Ansel Towne was born about 1808 and died on 30 October 1893. He was also known as Ansel Towne. 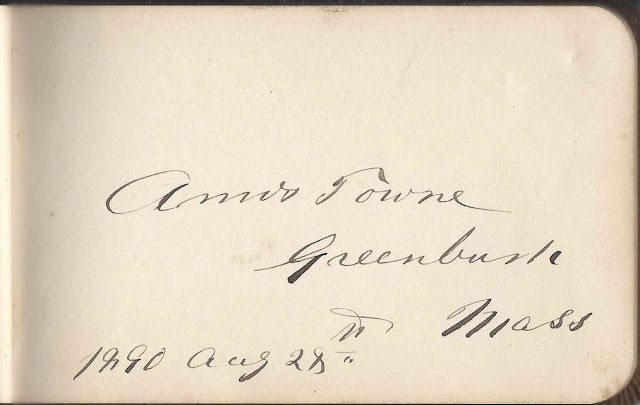 Amos Towne of Greenbush, Massachusetts, signed 28 August 1890. Katie, signed at Norway, Maine, on 12 January 1890. 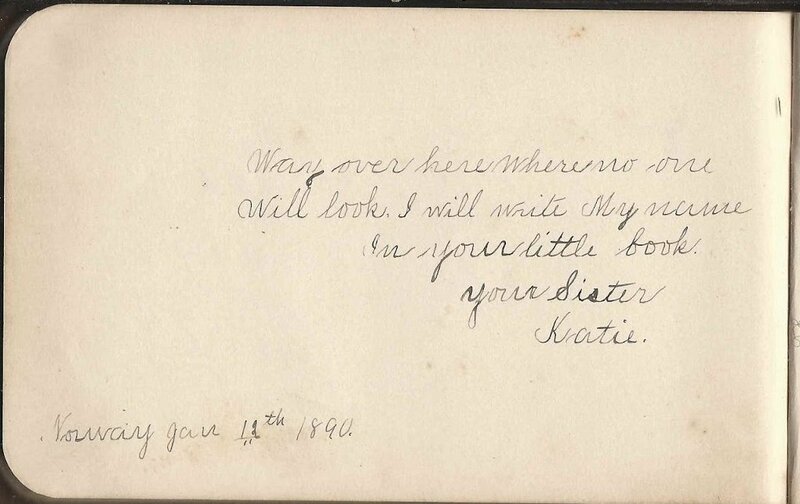 Bessie's sister Katie Towne "Way over here where no one will look, I will write My name in your little book. Your Sister, Katie"
Agnes E. Verrill, signed at Greenwood, Maine, on 9 May 1892 "I thought, I thought, I thought in vain. At last I thought of my name." This one's from my neck of the woods, so there are many familiar names here. "Yagger" refers to the Yagger Neighborhood or District in the northern part of Norway. Oh, I was hoping I'd get a rise out of you - so glad the names are familiar! When I was a kid, my parents were interested in mineralogy, so we spent lots of time in the Greenwood area. And later on I took my own kids there on mining adventures. Let me know if there is a certain image or more you want to see. Issie Cox was my great grandfather Carlton (Ned) Cox's mother.Her full name was Issinella Amanda Hobbs Cox. Minnie Cox was Issie's daughter. 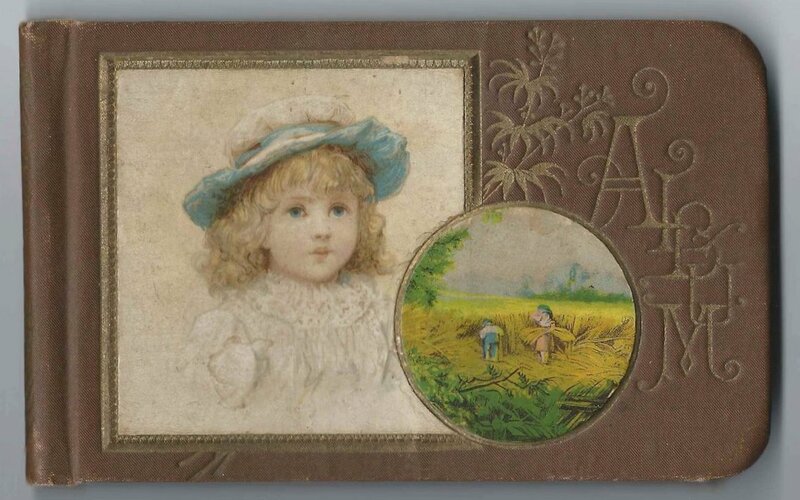 Issie was born Dec 15th 1853.She married Edwin Cox Sept 23rd 1875. Thank you for commenting - have updated the information on the Cox family and added images of Edwin's and Minneola's pages, just for you! Will was my grandmother's oldest brother. He later married Syble. They had one son, Francis. She died and he committed suicide. Poor fellow had a lot of sadness in his life.